Phase 1 of the Crucible's Redevelopement required the replacement of the theatre's aging and decrepit stage with one able to be reconfigured in a fraction of the time, with minimal risk, and provide the theatre with a stage that was to be both versatile for its stageing requirements, and rock-solid for the annual snooker tournament which is the life-blood of the city. Clive Odom from TheatrePlan produced a first-class scheme and specification for the proposed new stage, which fulfilled these requirements, and Giles developed a new product - the Easy-Out deck - which enables each deck to disengage from its neighbour as soon as it starts to lift - which was perfect for this application. The use of Easy-Out, combined with very thoughtful detailing on the supporting structure has achieved an tremendously successful installation, with the BBC having described it as 'The best stage they've ever worked on', and being delivered on time and on budget. 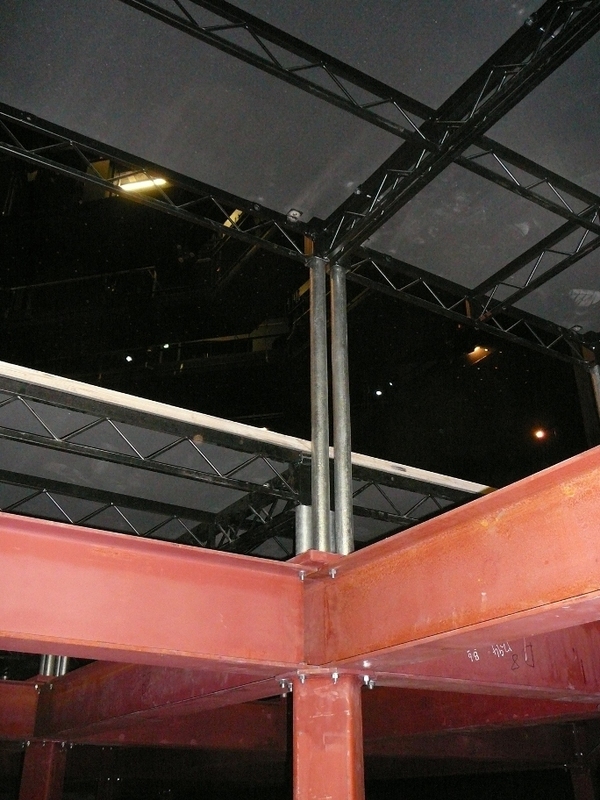 Reconfigurable and demountable Stage and substructure at The Crucible Theatre, Sheffield.